Have you found Snoop Dogg’s music videos to be somehow lacking? The rapper has staged videos in Brazil, wartime Casablanca, his parents’ house, the Pacific Ocean, and, famously, his hometown of Long Beach. He apparently decided the next logical location for a video shoot would be Liechtenstein, the tiny alpine nation wedged between Switzerland and Austria. But Snoop didn’t just want to use a few Liechtensteiner spots for his shoot. He wanted to rent the entire country. 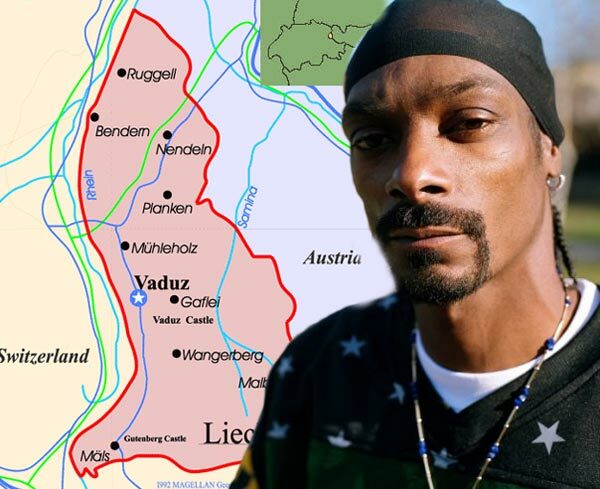 According to reports, Snoop Dogg approached the government of the tiny European nation, which has an estimated population of 35,000, to see if he could use the entire country as the set for an upcoming video. The star’s request was eventually denied, though only because his management team didn’t allow for adequate timing. Karl Schwaerzler, local property lease agent, told the Daily Mirror: We’ve had requests for palaces and villages, but never one to hire the whole country before. It would have been possible, but Snoop Dogg’s management did not give us enough time. Snoop Dogg has come quite a ways since his breakthrough appearance on the 1993 Dr. Dre hit ‘Nuthin but a G Thang’. The video introduced the 21-year-old Snoop in a long shot through his parents’ one-story Long Beach home to the young rapper’s modest, messy bedroom. Now he can rent entire countries. But only if they get back to him quickly enough.